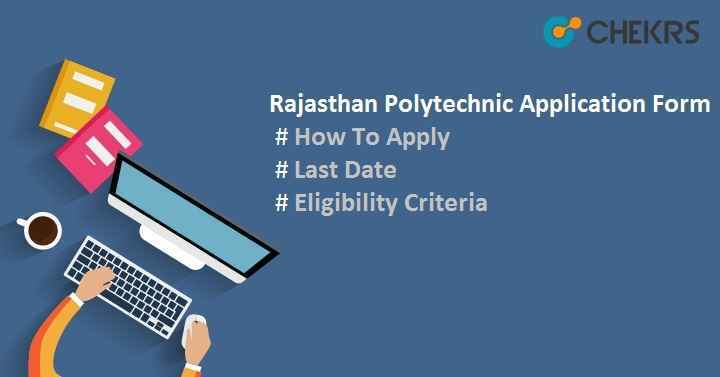 Rajasthan Polytechnic Application Form 2019: To take admission into first year of diploma course in the field of engineering & non-engineering, candidates have to fill the DTE Rajasthan Polytechnic Application Form. No entrance test will be held for admission into diploma courses. Only counselling will be scheduled on the basis of merit list prepared by DTE, Rajasthan. This admission & counselling process will be managed by Directorate of Technical Education, Rajasthan. The application form will be released in the month of June. The application form can be submitted online only through the official website on or before the last date. Candidates, who will submit the form successfully, will be considered for the admission process in polytechnic colleges of Rajasthan state for the academic session 2019-2020. Here we have mentioned the complete information related to Rajasthan polytechnic application form, last date of the form, application fee etc. Candidate should be born on or after 1st July 2004. Aspirants must have passed 10th /equivalent examination from Rajasthan board or any recognized board. Applicants must have scored at least 35% aggregate in Science and Mathematics together. Students should have Indian Nationality. It will be mandatory to have domicile of Rajasthan state to apply for 85% state quota seats. Follow the given link “hte.rajasthan.gov.in”. Go to the option available on the home page “Polytechnic Admissions”. Click on “Diploma First Year Admissions” as per your choice either for engineering or non-engineering courses. Click on “Apply Online” tab and then register with the given option. Fill all the details like name, father’s name, date of birth, mobile no etc and then submit it. Unique Registration Number will be generated after completion of registration process and sent on the mail id or mobile no. Login to the account with generated registration no. Fill the application form with the required details such as Last qualifying exam details, personal details, address details, bank details, other details etc. Upload the scanned images & relevant documents as per given specification. Fill the option form according to the order of precedence. Choose multiple college name & program by clicking on “Add Choice” button. Click on “Save” button after filling the option form, click on the Undertaking checkbox. Click on “Lock & Submit” button. Pay the application fee through the payment gateway via net banking/ debit card/ credit card/ e-mitra. Fill the details of bank card in the required field and then click on “Pay now”. With the help of application no & date of birth, candidates can see the preview of application form and take the print of the form for further use. To pay the fee through offline mode, submit the fee through the generated e-challan at e-mitra.